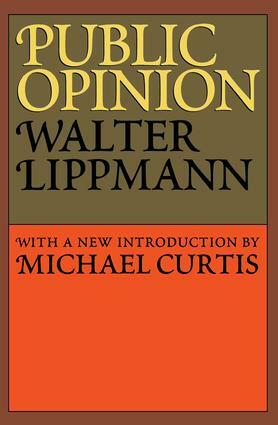 In what is widely considered the most influential book ever written by Walter Lippmann, the late journalist and social critic provides a fundamental treatise on the nature of human information and communication. As Michael Curtis indicates in his introduction to this edition, Public Opinion qualifies as a classic by virtue of its systematic brilliance and literary grace.The work is divided into eight parts, covering such varied issues as stereotypes, image making, and organized intelligence. The study begins with an analysis of ""the world outside and the pictures hi our heads,"" a leitmotif that starts with issues of censorship and privacy, speed, words, and clarity, and ends with a careful survey of the modern newspaper. The work is a showcase for Lippmann's vast erudition. He easily integrated the historical, psychological, and philosophical literature of his day, and in every instance showed how relevant intellectual formations were to the ordinary operations of everyday life.The field of public opinion research has produced much since this 1922 classic, but no work is more compelling in its argument or lasting in its impact. Lippmann's conclusions are as meaningful in a world of television and computers as in the earlier period when newspapers were dominant. Public Opinion is of enduring significance for communications scholars, historians,- sociologists, and political scientists. The Old Image in a New Form: Guild Socialism.